German Whist - thanoscardgamess jimdo page! This is an adaptation of classic Whist for two players, using a standard pack of 52 cards ranked A(high) to 2 (low) in each suit. The deal is 13 cards each. The stock of undealt cards is placed on the table, face-down except for the top card which is turned face-up and placed on top of the stock. The suit of this face-up card is the trump suit for the hand. 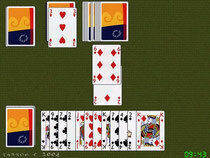 The play is in tricks and consists of two stages: in the first stage the players compete to win good cards from the stock to add to their hand; in the second stage, when the stock is empty, the object is to win the majority of the tricks.